Anyway, here’s a song from it, a song called LORD. 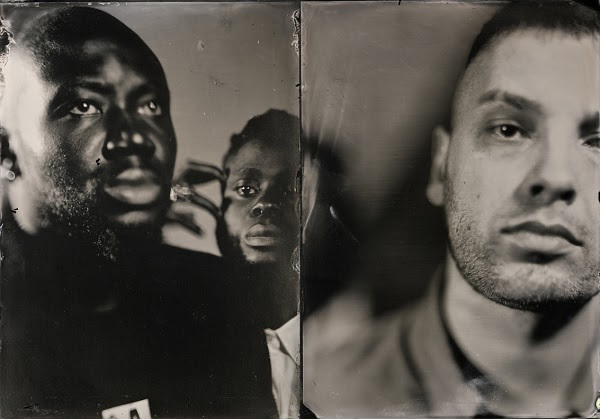 Edinburgh’s Young Fathers return with new single “Lord“, out now on Ninja Tune via Inertia Music. The typically undefinable track mixes gospel, hip hop and psychedelic tones and is taken from a yet to announced new album, out next year. Young Fathers are: ‘G’ Hastings, from Edinburgh, Alloysious Massaquoi, originally from Liberia via Ghana and Kayus Bankole, born in Edinburgh to Nigerian parents but partially raised in Maryland USA. Their live shows are complemented by Steven Morrison on drums. The group formed after meeting at an under-16s hip hop night at the infamous Bongo Club in Edinburgh when they were all in their teens. They started writing and recording together almost immediately, initially on an old karaoke machine plugged into a cheap cassette recorder at G’s parents house. In 2011 they set about recording a mixtape TAPE ONE in just over a week, finishing a track a day and having it available for download within two weeks of recording. They quickly followed this up with TAPE TWO, which was written and recorded in a similar fashion. Los Angeles based label, Anticon, discovered them online and within a few months had signed them for a short deal that saw both TAPEs officially released in 2013. The group, meanwhile, continued to tour, gathering an impressive reputation as a formidable live act. They played all over Europe and made their US debut at SXSW in March 2013. Following support from the BBC’s Zane Lowe and Lauren Laverne, and an appearance on influential USA talk show Jimmy Kimmel Live in 2014, TAPE TWO won Scottish Album Of The Year (The SAY Award), while their next album DEAD received the highly prestigious Mercury Prize for best album of 2014. Immediately after winning the Mercury Prize, Young Fathers travelled to Berlin where they continued making a new album in a freezing basement in a building near the railway yards. Returning to the more familiar (and warmer) basement studio in Edinburgh to finish their latest album, White Men Are Black Men Too, which was released in April 2015 to widespread acclaim. The band toured extensively throughout this time, touring the world including stops at Australia’s Listen Out in 2014, as well as Falls Festival, Field Day and an extensive run of sold out headline shows in the 2016. In 2016, the band were invited to support Massive Attack on their UK and European tour after working together on Massive Attack’s single “Voodoo In My Blood”. Young Fathers feature on 6 tracks on the Trainspotting T2 soundtrack, including “Only God Knows”, written specifically for the film.